Progress test scores lead to a qualification as: Insufficient, Sufficient, or Good. Standards are norm referenced, in other words, no pre-set standards are used. Two standards are required for decisions about the three qualifications: the Sufficient/Insufficient standard (S/I standard) and the Sufficient/Good standard (S/G standard). The progress test measures the development of knowledge from the start to the end of the undergraduate medical curriculum. Each progress test is administered to six cohorts of students. For each bachelor cohort a standard is set, whereas during the master a standard is set for each measurement moment (12 in total). After each progress test, the mean score (M), standard deviation (SD), I/S cut-off point (M-SD) and S/G cut-off point (M+0.5SD) of the %correct-incorrect scores are determined for each cohort (bachelor) or measurement moment (master). In this way six I/S and six S/G cut-off points are obtained. The I/S and the S/G cut off points are derived by determining the quadratic curve of best fit (the figure below shows an example, in which the measurement moments of the master are merged up to three cohorts). 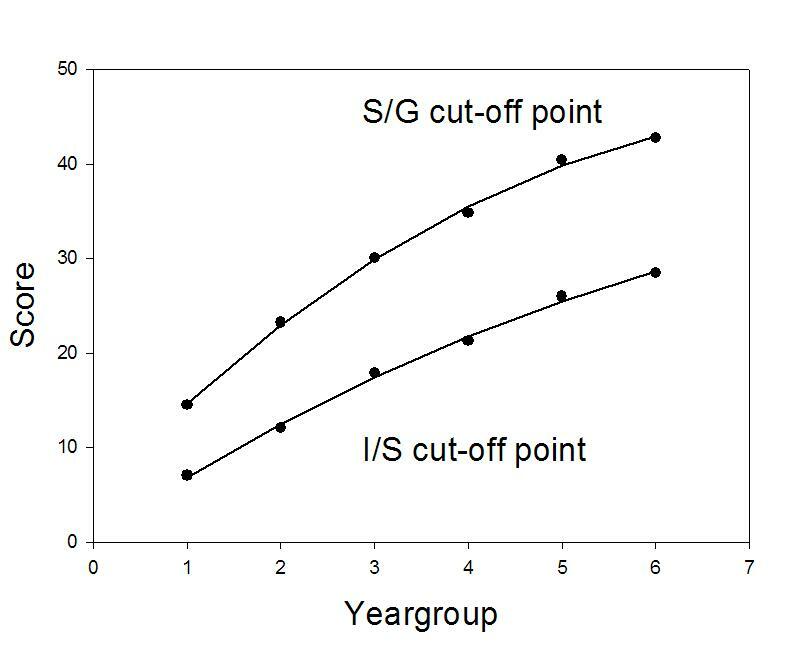 For the I/S cut-off point the curve of best fit is determined by estimating the curve that most closely approximates the series of I/S cut-off points. The criterion for the best fit is the smallest sum of squares: for each of the cohorts/measurement moments the deviation of the measurement from the point on the curve is determined and the sum of the squares of the deviations is calculated. Next, the level, slope and curvature of the curve are fitted to result in a minimum sum of squares. The resulting I/S cut-off point corresponds with the level of the line of best fit for the cohort/measurement moment in question. The S/G cut-off point is obtained using the same procedure for the S/G cut-off points. 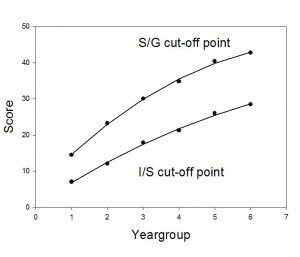 Obviously, both the I/S cut-off point and the S/G cut-off point should not decrease in consecutive cohorts and the S/G cut-off point should not be lower than the I/S cut-off point. Should such an undesirable or a similar situation occur, the Examination Committee is entitled to adjust the cut-off points. The outcome of one progress test is based on the results of four progress tests. The standard key of the previous progress tests of this study year are published here when available.